Today is the first day of school for my girls. Two of them are headed off to high school and the third is starting middle school this year. The one who is starting middle school is a bit apprehensive what with the new school, meeting new friends and all that. She is excited about one thing though, she’s going to get her own locker from now on! I was going to give her this free 1590D Set-Your-Own Combination Lock that I received to review, but the school issues them their own lock that the school has a master key for. So, my oldest daughter got this new lock instead and she has been playing around with it at home. This morning, of course, it was packed into her book bag, all ready for school. 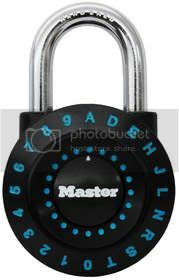 Here is what she wrote about the Master Lock Set your Own Combination Lock. All through my high school, and middle school life, I’ve used the standard black and white Master Lock, assigned to me first by my school, then kept there after when I moved to high school. I always figured as long as I didn’t give out the combination to anyone at random, I wouldn’t have to worry about anyone taking my lock, or breaking into my locker. Though there was apparently something flawed in that. I think it was my sophomore year in high school when I had my first problem with my locker. The first time, it had nothing to do with my lock. The boy, who later became known as my boyfriend somehow, had broken in just by hitting the door at the right angle and popping it back before the mechanism dropped back in place. I tried it once, and even I can do it, which really is something amazing. He’d taken one of my books, which at the time, I’d moved into my locker to let some of my closer friends borrow. Kind of like a secret library in my locker. After that though, someone really truly broke into my locker. I got to my locker one day, and my lock was gone, a new purple Master Lock in the bottom of it, and nothing missing. I didn’t trust the lock enough to leave it on for more than one day, but that same day, I went and asked the principal if maybe he’d found my locker suspicious or something, and had authorized a search? To my relief, he said he no, he hadn’t authorized a search but said he’d try to see if anyone else had. He came back with nothing comforting. I saw this as a chance that I might have lost my precious $10.00 books, so I went back home with as many as my books as possible in tow, and had my parents buy me a new lock. After that, I stopped bringing all my books to school. Soon after, I stopped lending them out altogether. This year though, I figured I’d try one of the locks with the changeable passwords. I found myself lucky when my mom told me to review the new Master Lock she’d gotten in the mail, and said I could keep it if I did that. I like this lock because if I know someone’s found out my combination, I could simply just change the combination again, as long as I have the lock and key. I can use my initials, or if there’s a letter that isn’t on the lock, I can use a number instead. I like the fact that there’s so many different possibilities for the combination that you could use. The operation of the lock is simple enough. When you first get it, it comes with a preset combination, and a small paper with instructions like any other lock. Unlocking and using the lock is the same as any other Master Lock. d. Then right again to the third number. b. Using the step to unlock the lock, you turn it right three times; set the combination, by going through the steps of unlocking the lock, using your chosen password to set it. c. When you’re done, turn the key back to the right 90 degrees, pull it out. Turn the wheel three times to the right, and close it. The lock is now set.